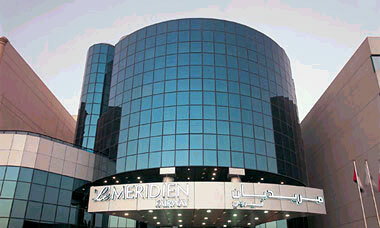 Le Meridien Fairway is a boutique styled hotel, which is centrally situated in the heart of Dubai. Located only minutes away from Dubai International Airport, commercial districts and shopping centres, it is also opposite the Dubai Creek Golf & Yacht Club. The hotel features 58 elegantly appointed rooms and suites. The facilities include 4 restaurants and bars, 24-hour room and laundry service, a temperature-controlled swimming pool, sauna and a fully equipped gymnasium. Business facilities include a boardroom with natural daylight located on the Mezzanine floor that can accommodate 12 persons. Accommodation: Up to 2 children under the age of 12 are charged a maximum of 50% (per child) when sharing with adults and are free in off-season. Cot free of charge. Food & Beverage: Children less than 4 years old eat free from all buffets. Children's healthy menu at very competitive prices available everywhere except Gourmandises. Regrettably, pets are not permitted.